The Midwest Society for Acoustic Ecology presents Soundwalks – quiet events leading groups to explore their relationship as listeners in the acoustic environment. 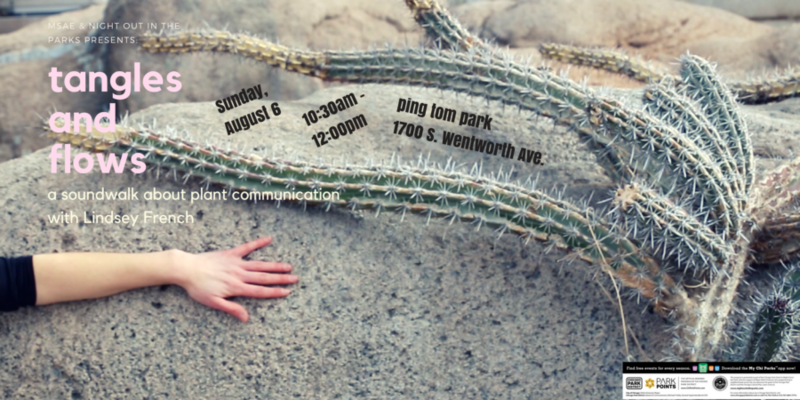 This soundwalk, “Tangles and Flows: Connective Listening” will be led by teaching artist, Lindsey French. You cannot move except to grow. With some exceptions, plants are immobile. As mostly sessile beings, plants nevertheless actively express themselves through growth and position, whether or not we detect these changes through human perception. Plants send promiscuous signs into the atmosphere by way of airborne chemicals. Communication often focuses on the sender, but what is possible when we consider our role as a receiver? What kind of communication is sense-based? Drawing on biological modes of communication, visitors will be invited to engage in practices of active and sensual listening. Alternating between motion and stillness, along the river and under a canopy of trees, we will attune to both sounds and sensation in practices of radical receptivity. *Meet at the Pagoda located at the Chinatown Water Taxi stop. From 18th street, Turn south onto Wentworth and west onto 19th. Walk along the path from 19th under the El and past the Divvy station. The Pagoda is beside the river. **Please bring sun protection, water and bug repellent if needed.